Unfortunately, accidents do happen, no matter how careful we are. When a medical emergency befalls our pets, we may find it difficult to make rational decisions, especially if something occurs during the middle of the night. That’s why it’s so important to have an emergency plan in place before you need it. Talk to your veterinarian about their emergency protocol, they are bound to have an out-of-hours number you can call. Ask them whether they provide 24-hour service or do they work with an emergency clinic in the area? Some practices have multiple vet on staff who rotate on-call services after hours. Keep the name, number and address of your local emergency clinic stuck to the fridge or stored in your cell phone for quick and easy access. Your dog may need emergency care because of severe trauma caused by a car accident or fall, choking, heatstroke, an insect sting, household poisoning or other life-threatening situation. 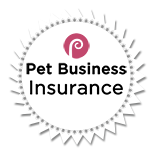 Pets who are severely injured or unwell may act aggressively toward you, so it’s important to protect yourself from injury. Approach your dog slowly and calmly, get down to his level, kneel down and say his name softly. If the dog shows aggression, move away and call for help. If he’s passive, create a makeshift stretcher and gently lift him onto it, supporting his neck and back in case of a spinal injury. Once you feel confident about transporting your pet safely, immediately bring him to an emergency care clinic and get someone to call the clinic ahead of your arrival to expect you. 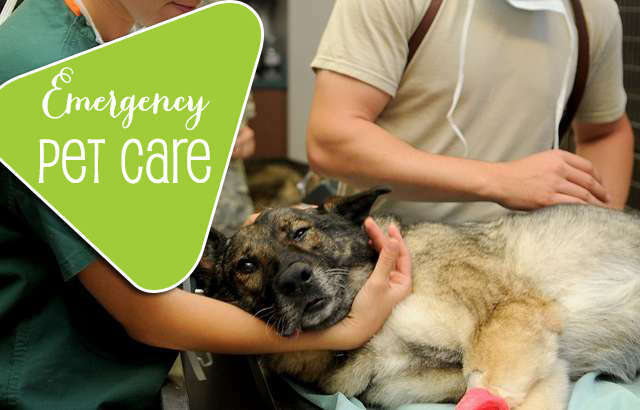 Most emergencies are best treated with immediate veterinary care, but first aid methods can help you stabilise your pet in preparation for the trip to the clinic. External bleeding due to trauma: attempt to elevate the affected part of the body and apply pressure to the wound. Choking: place your fingers in his mouth to see if you can remove the blockage. If you’re unable to remove the foreign object, perform a Heimlich maneuver by giving a sharp thrust to his chest. CPR may be necessary if your pet remains unconscious after you have removed the foreign object. First check to see if he’s breathing by placing your cheek next to his nose. If he is not breathing, place him on his side and perform artificial respiration by extending his head and neck, holding his jaws closed and blowing into his nostrils once every three seconds. Ensure a sealed contact. If you don’t feel a heartbeat, incorporate cardiac massage while administering artificial respiration, three quick, firm chest compressions for every respiration until your dog resumes breathing on his own.